» Sign Districts: Or How Can The City Be Stopped From Opening a Pandora’s Box Filled With Larger, Brighter, More Intrusive Forms of Outdoor Advertising? Sign Districts: Or How Can The City Be Stopped From Opening a Pandora’s Box Filled With Larger, Brighter, More Intrusive Forms of Outdoor Advertising? First, a little history: Several years ago a company named World Wide Rush started putting up supergraphic wall-wrap ads on buildings around L.A. When the company was cited by the city for violating a ban on new off-site advertising, it went to court, claiming that the ban was unconstitutional, one of the reasons being that the city had allowed the same kind of ads to go up legally in areas designated as sign districts. A federal judge named Audrey Collins agreed, and ruled that the city couldn’t prohibit the company’s signs at 21 different locations around the city. The city appealed that decision, and the case is awaiting hearing before the 9th Circuit Court of Appeals. In the meantime, two more companies that specialize in supergraphic ads, Liberty Media and SkyTag, have challenged the off-site ban on the same grounds and Judge Collins has forbidden the city to take any action against signs put up by those companies at another five locations. In addition, a number of other lawsuits are pending in the federal court that challenge the Los Angeles ban on the grounds that the sign districts give the city too much discretion to allow advertising by certain companies but not others. So how has the city addressed this situation? The obvious way would seem to be to stop giving sign companies more ammunition for their challenges to the off-site ban. In other words, stop allowing exceptions through sign districts, at least until a ruling comes down from the 9th Circuit, which isn’t expected for at least another year. But no, the city is proceeding as if it had never heard of the lawsuits and the issues involved. One new sign district downtown is now pending approval by the city council’s Planning and Land Use Management Committee. 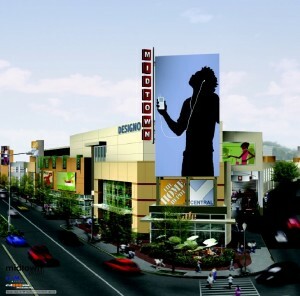 Several others are working their way through the city planning department, and one of them, for a large shopping center called Midtown Crossing, is being heavily promoted by Councilman Herb Wesson. A revised sign ordinance now being considered by the City Planning Commission (CPC) does make the requirements for establishing sign districts somewhat more restrictive, but the question of how the very existence of sign districts may enable sign proliferation isn’t addressed. And most disturbingly, the revisions propose to grandfather pending applications for sign districts, allowing them to proceed all the way to the city council under current, more relaxed requirements. Lawsuits, court rulings be damned, let there be more signs. City Attorney Rocky Delgadillo has been silent on the subject, even though his office has had to devote large amounts of time and resources to defending the city against these legal challenges. And neither of the major candidates for Cty Attorney in the March 3 primary election, Carmen Trutanich and City Councilman Jack Weiss, has weighed in on the question of whether the city should be deliberately taking actions that undermine its ability to enforce its off-site sign ban in the immediate future. However, the Coalition to Ban Billboard Blight solicited an opinion from a nationally-known attorney who specializes in sign law, and that opinion confirms the fears of those who cast a leery eye upon sign districts. Referring to the Los Angeles sign ordinance, he says, “As long as the Ordinance continues to permit the City to create new sign districts under which the general prohibitions do not apply, that possibility creates an unacceptable risk that such general prohibitions could be enjoined, and thus that new signs would be permitted to proliferate throughout the City.” Read the full memorandum here. So what message will the city be sending its citizens by continuing to move applications for sign districts through the approval process, and codifying new sign district regulations in the city sign ordinance? That it doesn’t really care if the massive electronic billboards and supergraphic signs that have been a feature of existing sign districts such as the one in Hollywood spread throughout the city?